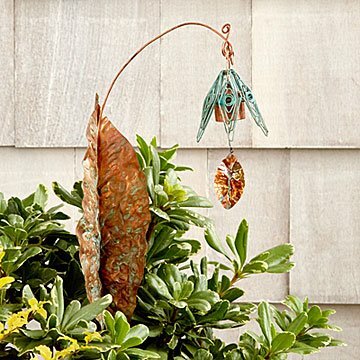 Add a little extra whimsy to your garden with these handcrafted bellflower-shaped chimes. There are more than 500 varieties of bellflower plant, each uniquely beautiful. Their colors vary and they bloom at different times, but each is one of nature's little treasures. Like those bell-shaped blossoms, Lisa Pribanic's handcrafted chimes are charming and unique. To make her stylized flowers, Lisa places a handmade bell inside petals of copper and aluminum wire. She then attaches a leaf, hand-forged from copper, to the bell's clapper. By hanging the newly formed flower from a garden stake (complete with another handmade leaf), Lisa creates metal flowers designed to add a touch of whimsy to your garden. Over time, the leaves' gentle patinas become richer, giving every piece its own personality. Stake it in a green plant to add a bit of color, or place one among your bluebells, and enjoy the soft chime when a breeze rolls in. Handmade in New Jersey. Every piece of Lisa’s work starts life as an original, but becomes truly unique over time. Like living things, her designs are constantly changing as they age. She’s proud to give people the opportunity to own a bit of "musical garden art,” and enjoys watching people’s reactions when they see and hear her designs for the first time. 3" L x 3-4" W x 17-18" H, press stake into soil about 4-5". Handle gently, plant by pushing the round stake at the base of the leaf. Do not push from the top of the leaf. Colors will vary in small range depending on the metal's mood. This piece is made very well and is very appealing to the eye. It will look great in my niece's garden. I'm thinking of getting another one for myself!